Surf-Lines Adventures Outdoor Pursuits CentreSurf-Lines provide canoeing, kayaking, climbing, coasteering, gorge scrambling, mountain walking, orienteering and team building. Our experienced instructors provide exciting 2hr, 1/2 day, full day and multi day activities. Looking to develop your paddle skills? 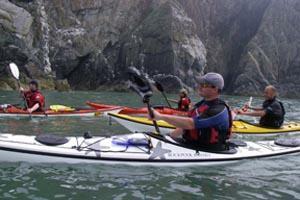 Why not join us on one of our popular sea kayak, canoe or white water skills courses. Outdoor activity provider to individuals, families and groups. Watersports and mountain sports for all ages. Retail outlet onsite. We have a well stocked canoe and kayak retail shop. Canoe and Kayak rental Changing rooms for activity customers Classroom facilities Excellent Activity Coaches We can cater for large groups wanting to undertake activities. Please see our website for course dates and times. Please see our website for individual course pricing. On the shores of Llyn Padarn, next to Padarn Country Park (Glyn Lagoons).